Opening Reception: November 5, 7:00 to 10:00 p.m.
Cernuda Arte is pleased and honored to announce the opening of Still Going Strong, a solo exhibition that brings together fifty recent works by renowned contemporary Cuban master, Gina PellÃ³n. This new exhibition inaugurates on Friday, November 5, with a celebratory Opening Reception from 7:00 to 10:00 p.m. The artist will be traveling from Paris to Miami to attend the evening premiere. This is a welcomed opportunity for visitors to view a great show and meet the artist. The event is free and open to the public. The exhibition will run through December 15, 2010. As an endeared, respected and applauded artist from the Cuban diaspora in the international milieu, Gina PellÃ³n has enjoyed a successful career and many accolades, including the bestowal of one of Franceâ€™s most distinguished titles, that of Chevalier in the French Order of Arts and Letters â€“ an award that recognizes the eminency of artists and writers who have contributed significantly to furthering the arts in France and throughout the world. She has also received praiseworthy comments and critiques for her outstanding qualities as an artist by renowned writers and art celebrities, such as, Wifredo Lam, Roberto Matta, Asger Jorn, JosÃ© Pierre, Michele Anthonioz, Ã‰douard Jaguer, Ã‰douard Glissant, Alain Bosque and JosÃ© GÃ³mez Sicre, to name a few. All these laudable recognitions throughout the years are the result of an exemplary-productive life of an established artist who has always focused on translating authenticity, audacity and beauty in a unique body of work. Her Paris home-studio, for 51 years, is her sacred shelter and retreat. Aglow with harmony, an organized atmosphere permeates Ginaâ€™s dwelling, graciously filled with books, magazines, music, paintings, drawings, sculptures, art objects, treasured Cuban collectibles and many, many memories â€“all vital and seasoned companions of a life well chosen. It is ultimately a self-ruling space, where the artist lives and concocts a significant-ongoing endeavor. Dynamic and luminous, Gina PellÃ³nâ€™s work is based on bold colors, vigorous brushwork and gestural rhythm. 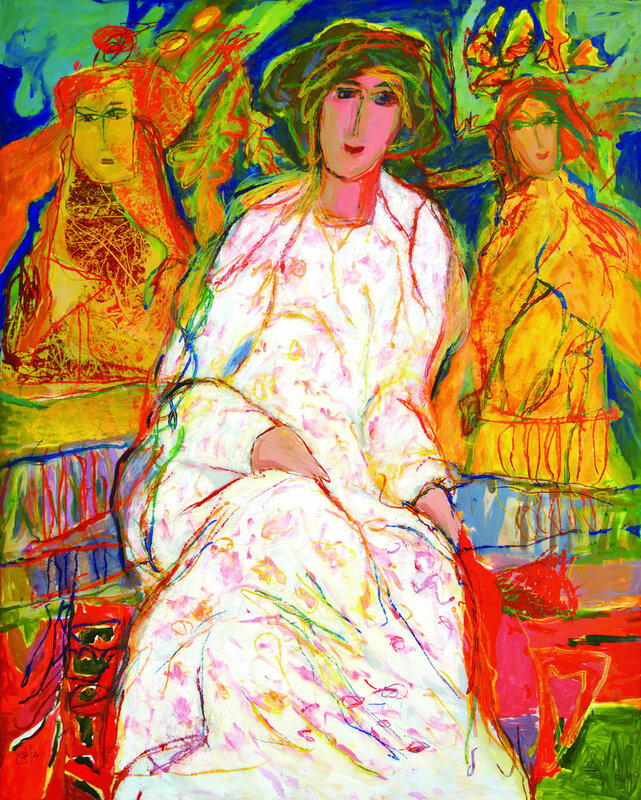 Prismatic figures of women, visages â€“ and at times â€“ groups and gatherings of people, stream in her compositions conveying spontaneity at its best. As a dominant element in this late-period rendition, one senses a marvelous kind of freshness â€“particularly in the way the artist multi-layers the colors and lets loose the free-flowing lines that so exquisitely create her iconography. Passionate and persevering, Gina exalts that familiar state of grace and joie-de-vivre adherent to her persona for so many years. And this time around, still fully in command of her talents â€“ and with much to say at 84 years of age â€“ the painter once again delivers a telling show with superb examples of her work. As gallery director, RamÃ³n Cernuda, says in his Still Going Strong catalog salute to the artist, [â€¦] Gina arrives at her late style of painting full of energy and enthusiasm. Her creations are freer and seem more spontaneous. The contours of her figures no longer contain, they merely suggest. The expressionism of the unbridled brushwork is loose of formality and devoid of restriction. The palette contributes color fields that clash and make peace â€“inevitable destiny of neighborsâ€¦ What an honor to celebrate this exhibition. The festivity is surely merited. We recognize a lifetime of dedication to art. Much deserved. 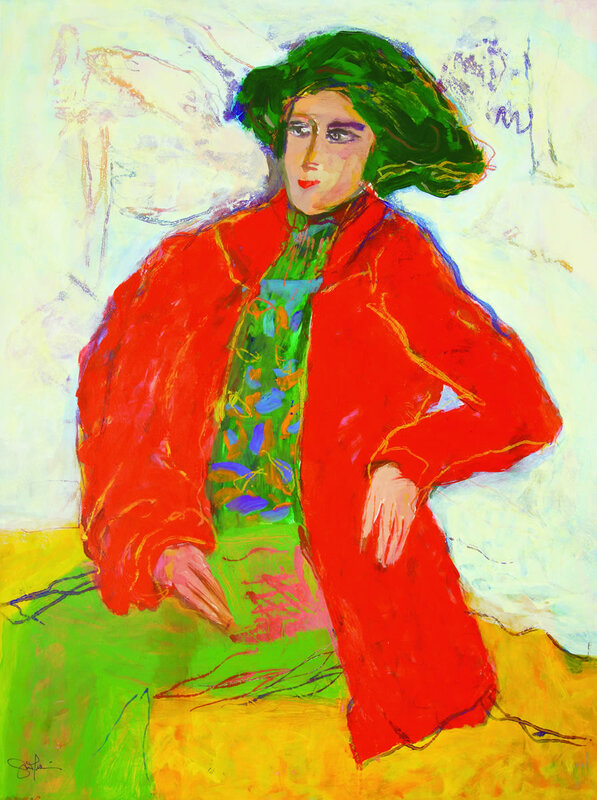 Standouts of this exhibition include, Moonlight, an imposing large-format canvas that fuses together an energetic atmosphere and a suffused affection for the figures portrayed, and The Praying Mantis, an arresting depiction of a seated woman wearing an intense-red color jacket, a favorite hue in the artistâ€™s palette. GINA PELLÃ“N was born in Cumanayagua, Cuba, on the year 1926. At the beginning, she attended the San Alejandro Academy in Havana, Cuba where she received a solid-six-year formative training which later on helped her become a knowledgeable and confident artist. Her resolute spirit to stay on the pulse and a no-fear personality takes her to France. A born-again person in 1959 (the definitive year when Gina left the island with another group of Cuban artists and arrived in Paris), she immediately fell in love with the city and decided to stay permanently. Paris offered the young artist, a vibrant atmosphere, a bountiful cultural life and a different group of friends. From this moment on, and despite the obvious difficulties of adaptation while living in exile, she pursued her long-standing desire to become a professional artist and worked on it hard. She expanded her horizons, mingled with personalities such as AndrÃ© Breton, Matta, Lam, Asger Jorn, and learned about the popular art movements of the times. Gina was once asked in an interview about the artists that had a greater influence on her. She mentioned Kandinsky, Paul Klee and Picasso, but also included with familiarity, the experimental group linked to action painting, the surrealists, and after this, the definite contact in the â€˜60s with the spontaneity and total freedom of expression conceived by the avant-garde COBRA movement in Europe. This important discovery touched and transformed Ginaâ€™s artwork. In the years that followed, she faced the empty canvas in a different way and defined the signature alchemy that has captivated, for many years, art enthusiasts and art collectors worldwide. Gina PellÃ³n has been featured in more than fifty solo exhibitions and included in more than 100 group shows. Her career in Europe has been prolific and successful, with extensive exhibitions in Paris, Lausanne, Toulouse, Brussels, Amsterdam, Silkeborg, Copenhagen and Larvik. She has also shown internationally in major museums, institutions and art fairs in other cities such as, Geneva, Barcelona, London, Miami, New York and Caracas, among others. Her work is held in the permanent collections of many distinguished private, public and corporate art collections around the world. Gina PellÃ³n resides and works in Paris, France. The exhibition is accompanied by a fully-illustrated catalog. Forty-nine artworks from Still Going Strong are featured in color. It also includes an essay by professor, art historian, curator, writer and Latin American & Caribbean art specialist, Dr. Carol Damian. She is the Director of the Patricia and Phillip Frost Museum at Florida International University, and teaches Art History in this same university. Also included are special words of recognition by curator and gallery director, RamÃ³n Cernuda, in the context of this great accomplishment by the artist.